Like The Gutterpunch Confessional on Facebook to receive five secret bonus comics! Enter your email below to receive The Gutterpunch Confesssional in your inbox. Enter your email below to receive The Gutterpunch Confesssional newsletter. 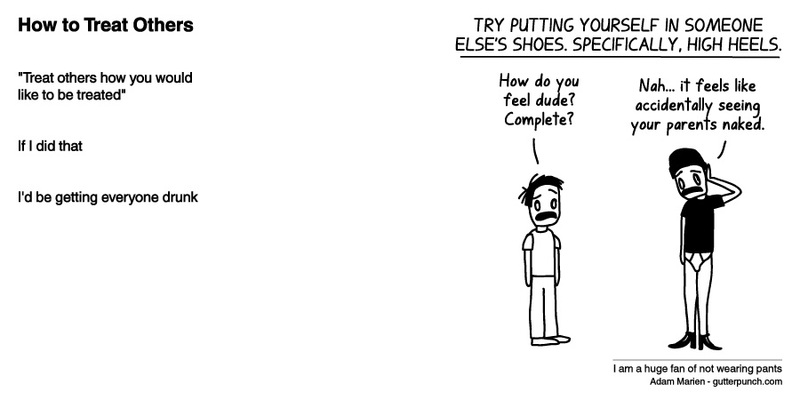 TRY PUTTING YOURSELF IN SOMEONE ELSE’S SHOES. SPECIFICALLY, HIGH HEELS. How do you feel dude? Complete? Nah… it feels like accidentally seeing your parents naked.